By Jay Rogers. Posted July 27, 2017. 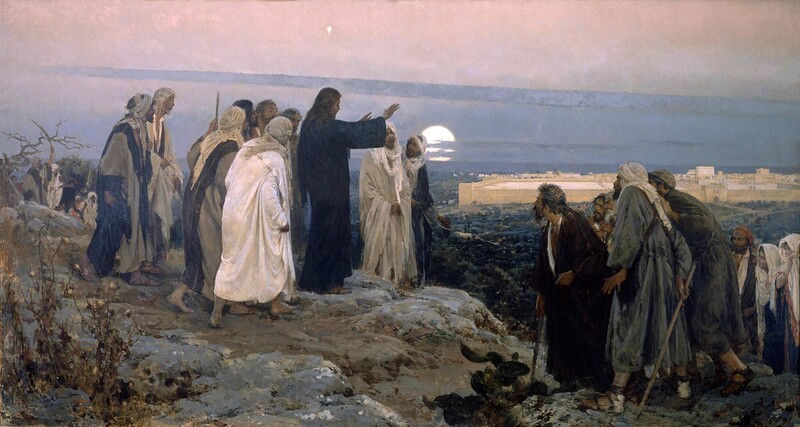 Painting by Enrique Simonet Lombardo — Flevit super illam (1892) — “He wept over it.” Click to enlarge. The following is based on an excerpt from my soon-to-be-published book, In the Days of These Kings: The Prophecy of Daniel in Preterist Perspective. In the book I discuss the prophecy of Zechariah as “bridge” material between Daniel and the New Testament. Behold the day of the Lord is coming, and your spoil will be divided in your midst. For I will gather all the nations to battle against Jerusalem; the city shall be taken, the houses rifled and the women ravished. Half of the city shall go into captivity, but the remnant of the people shall not be cut off from the city (Zechariah 14:1-2). Nearly all Christians would agree that there is one way to God and one faith. However, many of us were so steeped in dispensationalist thinking at one point — especially in terms of eschatology — that it requires a paradigm shift to understand that the prophets saw no division between the Old and the New Covenant. Therefore, when they spoke of Israel, they spoke at the same time of the Church. I have debated with premillennialists who will cite Zechariah 14 to claim that a great earthquake will split the Mount of Olives either at the beginning, middle or end of a future Great Tribulation. “When did that already happen in history?” is the common retort. In short, I don’t believe that the Mount of Olives will be literally split down the middle in a soon coming war over the existence of a modern geo-political Israel. I have very intelligent friends who believe this will literally happen very soon. Early Christians didn’t have trouble seeing this applied to AD 70. In his Proof of the Gospel, written around AD 318, Eusebius of Caesarea held to this preterist interpretation of Zechariah 14:1,2. The fulfilment of this also agrees with the passages quoted on the destruction of the whole Jewish race, which came upon them after the coming of Christ. For Zechariah writes this prophecy after the return from Babylon, foretelling the final siege of the people by the Romans, through which the whole Jewish race was to become subject to their enemies: he says that only the remnant of the people shall be saved, exactly describing the apostles of our Saviour (Eusebius of Caesarea, Proof of the Gospel, 2.3.50,53). Zechariah 14:3-7 then shifts from divine retribution on Jerusalem to God’s anger toward the surrounding nations. One of the problems that dispensational thinking has introduced into the modern interpretation of Bible prophecy is the discontinuity between the Old and New Covenant – between natural Israel, the Old Covenant Church – and the spiritual Jerusalem, the Bride of Christ. In the eyes of God, He has only one people, the ecclesia, the “called out ones” of God. In effect, Zechariah goes on to say that after physical Jerusalem was thoroughly defeated, God would fight for His people, spiritual Jerusalem. Then the Lord will go forth and fight against those nations, as when He fights on a day of battle. In that day His feet will stand on the Mount of Olives, which is in front of Jerusalem on the east; and the Mount of Olives will be split in its middle from east to west by a very large valley, so that half of the mountain will move toward the north and the other half toward the south. You will flee by the Valley of My mountains, for the valley of the mountains will reach to Azal; yes, you will flee just as you fled before the earthquake in the days of Uzziah king of Judah. Then the Lord, My God, will come, and all the holy ones with Him! In that day there will be no light; the luminaries will dwindle. For it will be a unique day which is known to the Lord, neither day nor night, but it will come about that at evening time there will be light (Zechariah 14:3-7). The Mount of Olives would then be split in its middle from east to west by a very large valley – Here is an image of the people of God being split into two groups, the faithful remnant who will not be cut off from the city – the spiritual city of God – and those who will be taken into captivity – those who rejected God’s promise (Zechariah 14:2). You will flee by the Valley of My mountains, for the valley of the mountains will reach to Azal – At first glance, it is easy to pass this over as an insignificant topographical remark. “Azal” is thought to be the valley now known as Wady Yasul. The Hebrew name is Nahal Atzal. The mouth of the valley lies at the base of the southernmost summit of the Mount of Olives. There is a possible allusion to the commandment of God to His people in Zechariah 14:5 to “flee by the Valley of My mountains” in the Mount Olivet Discourse in Matthew 24. Many preterists believe that this was fulfilled when the Christians left in Jerusalem fled to the city of Pella — according to the Church historian Eusebius. They would have had to flee in the direction of the Mount of Olives. Then they eventually made it to the Jordan river and made the journey north to Pella. In fact, Theodoret of Cyrus, writing in AD 460, believed that Zechariah 14:4, the Lord’s feet standing on Mount Olives, was specifically fulfilled by Vespasian’s troops and the 42 month long siege of Jerusalem from the spring of 67 to the fall of 70. Theodoret is here quoting from the Greek Septuagint, which has some significant differences from the Hebrew Masoretic text. Zechariah 14:4 – On that day his feet will stand on the Mount of Olives – which is opposite Jerusalem from the east – From where he ascended into heaven, from there he gives victory to those fighting against the Jews. He then says the mountain would be divided into four parts, one going to the east, one to the west, one to the north and one to the south. Zechariah 14:4,5 – The Mount of Olives will be split, half of it to the east and half of it to the sea in the west, a vast expanse, and half the mountain will face the north and half of it the south, a great valley. The valley of the mountains will be blocked as far as Jassa, and will be blocked in the way it was blocked in the way it was blocked in the face of the earthquake in the days of Uzziah king of Judah – By mountain he refers to the cohort of the enemy divided for the purpose of besieging Jerusalem, some occupying its eastern part, some its western, others guarding the north, others the south (Theodoret of Cyrus, Commentary on Zechariah). Zechariah 14:1-7 is primarily about the siege of Jerusalem and the destruction of the Temple in AD 70. There is first the natural and then the spiritual. First, God defeated His adulterous Bride, earthly Jerusalem. Then He began to war against the heathen enemies of His true Bride, the heavenly Jerusalem. The spiritual warfare that is accomplishing this is ongoing. It began in the first century and it continues to the end. The warfare spoken of in Zechariah 14:1,2 is about physical warfare and the destruction of physical Jerusalem. Then the warfare of Zechariah 14:3-7 is about spiritual warfare in which the Lord himself fights for spiritual Jerusalem, His Bride, the Church. In the 1990s and 2000s, I took 12 short term missions trips to Ukraine and Russia spending several months out of my life helping two Christian media ministries. When I was in Russia I ran into ministries that had raised millions of dollars to get the Jews out of Russia to Israel. The goal was not to evangelize Jews. It was to get them to Israel because of biblical prophecy about the “end-times.” When I would ask them on what basis they believed that, they would say that the Old Testament spoke of the regathering of the Jews to Israel. I tried to offer the covenantal view on the evangelism of ethnic Jews that does not necessitate an end-times scenario with a restored nation-state of Israel and a resulting war that will kill two-thirds of the Jews who will return. That wasn’t heard though. They believed they had a prophetic mandate to see the Jews return to Israel rather than evangelize the Jews who remained in Russia. Now it’s interesting that none of the prophets of the Post Exile period, Haggai, Zechariah and Malachi, speak of regathering. What they do instead is to delineate between true and false Israel, true and false shepherds, a great shaking of the heavens and the earth, God’s winnowing fan, etc. The “Church” is the seed of the woman that existed from the time of righteous Abel, to the time of Abraham, Moses, the prophets and the time of Jesus until today. It’s not that Israel was separated from the Church — but it is that the unbelieving Jews within the Old Testament church were cut off from the “Israel of God” (Galatians 6:16), which now includes believers from all nations.